Wyoming County Commissioner Tom Henry (second from right) reads an anniversary proclamation that was prepared for an Aug. 1 meeting of the Tunkhannock Borough Council. 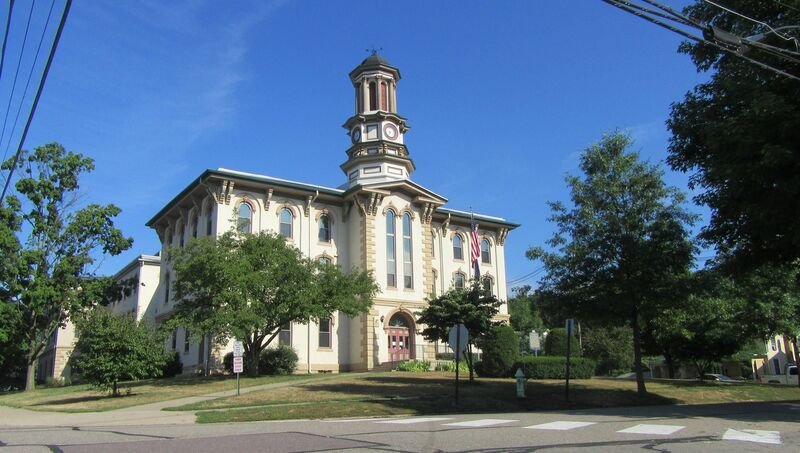 Tunkhannock was established as a borough and county seat 175 years ago when Wyoming County was formed from a part of Luzerne County. In a relatively short meeting of the Wyoming County Commissioners, the board discussed a deed easement with PennDOT concerning Road Side Rest Park in Eaton Township, recalled the recent River Day celebration in Tunkhannock with much acclaim, and prepared a proclamation for the upcoming celebration of Tunkhannock’s 175th anniversary. County Solicitor Paul Litwin (above, left) recently conferred with PennDOT officials and reconfirmed the deed easement with them. Wyoming County technically owns the land on which PennDOT established a park in the 1950s, but no county funds or staff are involved with the park, and PennDOT makes and enforces park rules. Commissioner Tom Henry felt it was necessary to reconfirm the unique partnership as people seeking to rent pavilions at the park often call the courthouse instead of PennDOT. Commissioner Ron Williams (right) suggested to Litwin that, while the topic is still on the table, Litwin should make sure that the county’s liability insurance is in accordance with anything that might happen at the park. Henry agreed, noting that Bowmans Creek is part of the park and poses potential risks. When the borough of Tunkhannock was incorporated on Aug. 8, 1841, it was a small frontier town in northwest Luzerne County. The next year, Wyoming County was formed, and Tunkhannock became its seat of government. The commissioners prepared a proclamation to deliver to the Mayor and Tunkhannock Borough Council at their next meeting on Monday, Aug. 1. The document references highlights in Tunkhannock’s history, such as the building of the courthouse in 1843, its inclusion in 2005 on the National Register of Historic Places, its designation 12 years ago as a Tree City USA by the National Arbor Foundation, and its recent designation as a PA River Town by the Susquehanna Greenway Partnership. The commissioners agreed that the 12th annual River Day celebration held on July 23 was perhaps the best yet, especially with so many officials in attendance to salute Tunkhannock as an official ‘PA River Town.’ Henry spoke on behalf of the board at the event, which reportedly drew more than 650 adults and children to Riverside Park. “It was nice seeing so many people enjoy the river – and swimming in it,” said Henry, in reference to the concerted efforts of various agencies and individuals over the past few decades to make the waterway cleaner and more accessible for recreation. “There was a day when I wouldn’t have put a toe in it,” he remarked. Warm Night at the Prison. Prior to the meeting, Henry related that he’d been at the Wyoming County Prison until about 10:30 the previous evening because the air conditioning units were down for a couple of hours. 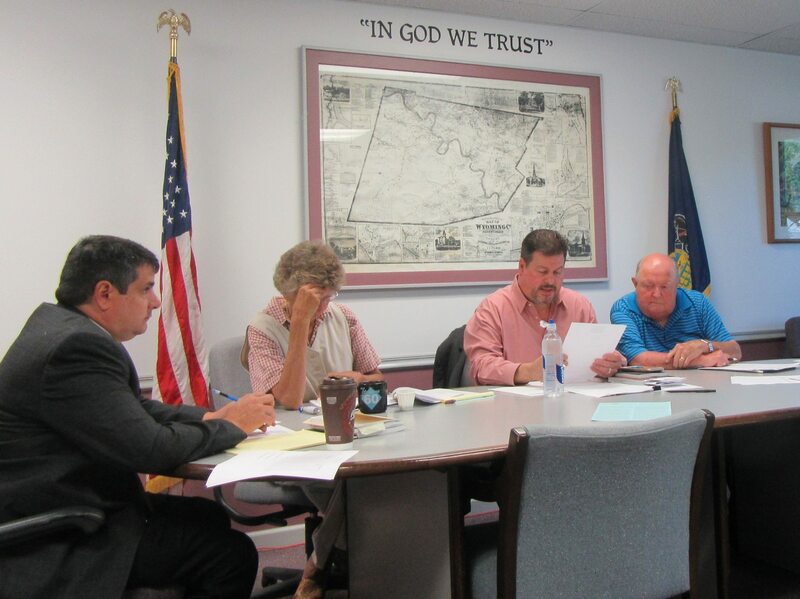 The commissioners noted that the Borough Council meeting during which the aforementioned proclamation will be delivered will be held on Monday, Aug. 1 due to the Triton Hose Company’s annual carnival next week. The commissioners will be attending a statewide commissioners conference on Tuesday, Aug. 9 and will therefore move their next meeting to Thursday, Aug. 11 at 9 am.